If I were to guess, I’d say many of you have heard of Verona, Italy. Now, if you have any little bit of doubt in my statement, let me ask you one question…Have you ever read one of those famous Renaissance plays written by some guy named William Shakespeare? Yes? Then, perhaps it was Romeo and Juliet? The fact is, Verona was the setting of that popular tragedy. Getting to this UNESCO World Heritage Site is extremely simple due to its well positioned location in the northern portion of the Italian peninsula. From Milan (or Venice) you only need to take a roughly 1.5 hour train into Verona’s main train station, Verona Porta Nuova. From there, you can begin to write your own Verona story. With well-preserved Roman ruins to incredible examples of renaissance architecture, Verona, itself, is a museum. My first impression of this originally Roman city was created after gazing upon a massive, brick-laid defensive wall which was still pretty much intact. Being from a region in the United States where our history dates back only about 200 years, I bet you can guess what my impression was like. The best part, it was only the beginning. Walking down Corso Porta Nuova, Verona’s most popular attraction was insight. Located in the city’s largest plaza is the third largest Roman arena in all of Italy. 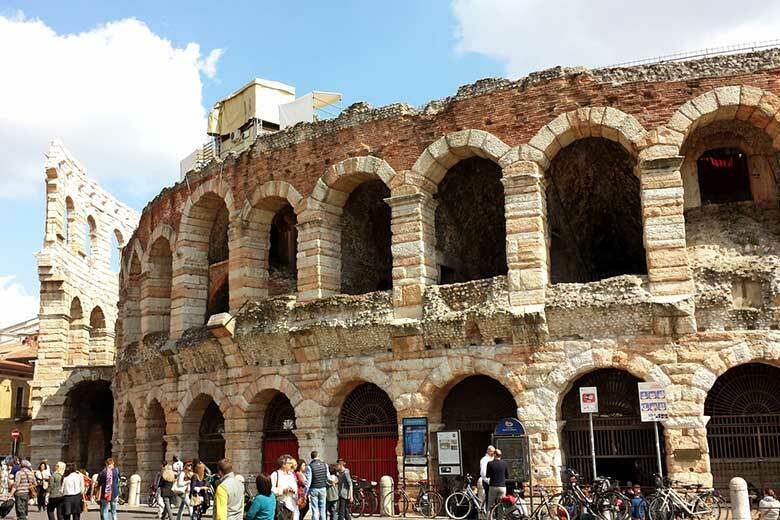 With seating for over 25,000 spectators, Verona’s arena is still used today for concerts, operas and other events. Can you imagine watching a show on the same marble seats as the Romans? Among these spectacular structures you also have several remains of the old Roman gates (Porta Borsari, Porta Leoni), fortified castles (Castelvecchio, Castel San Pietro), remarkable churches (Duomo di Verona, Basilica of St Zeno) and other medieval sites portraying Verona’s history extremely well. For all of the literary fans, remember I mentioned Shakespeare’s play, Romeo & Juliet? Well, just off the famous Piazza delle Erbe on Via Cappello, you can see the house and stand on the balcony of Shakespeare’s fictional character, Juliet. Did I even forget to mention you can take a short stroll to visit Juliet’s tomb at Capuccin Church? The point is, no matter what your personal Verona story will be about, the city has a little bit of everything for everyone.